Boyd's :Lil Sumptin Gift Set, New for Fall 2005; Each Boyds Lil' Sumpthin Gift Set features a 6" Boyds friend, a matching resin Kringle Bell ornament, a coordinating gift bag and tissue paper. Featur..
Boyd's :Lil Sumptin Gift Set, New for Fall 2005; Each Boyds Lil' Sumpthin Gift Set features a 6" Boyds friend, a matching resin Kringle Bell ornament, a coordinating gift bag and tissue paper. 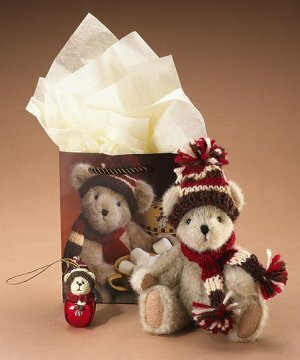 Features a fully jointed light beige bear with knit hat and scarf and matching Kringle Bell.